There is a special knack to reading plays and unless you are used to it, it can be frustrating. But for those of us who enjoy reading plays, it can be difficult to find reading material that isn’t one of the classics that we’ve all already read a dozen times, or not the latest Pulitzer Prize winner. And if you are a student or a younger reader, finding plays that are targeted to you is next to impossible without buying individual scripts directly from play publishers. 5-Minute Plays for Teens is just the ticket! The plays in this anthology have a wide range of topics and all of them relate-able to the teen reading audience. Most are two or three person plays so it would be easy to even sit and read these out loud with a friend or two. As is typical with almost any anthology, not every script appealed to me, but there were plenty of them that did. One of my favorites was “Over the Moon” by Lavinia Roberts in which a perfectionist male teen is trying to tutor an artsy female student who is planning to turn in her science paper as an interpretive dance. The short play pushes stereotypes to the edge, adds plenty of humor and a resolve of understanding that is often missing in a short play like this. I would love to see this done or direct it myself sometime. “Rainbow Bunnies in the Zombie Apocalypse” by Bennet Preuss was strangely stupid but fun. This is precisely the sort of short play that could easily get students who might normally enjoy theatre into reading, watching, or even being in a play. Plays such as “The Sibling” by Jeanmarie Collins are nice, even important for letting young readers know that others might have similar issues, and Collins writes a tight, poignant script. It’s not something I would consider producing nor have interest in seeing performed, but there is a lot of value in having a script like this in such a collection. Finally, I really enjoyed “We. Are. Un. Cool.” by Nicole Pandolfo in which, unless you attend an arts school, probably really defines many of us who would be reading a collection of five-minute plays. Although the characters are teen females, I could still identify with students hiding out during a physical education class and complaining about peers. This should be a hit with most readers. A book like this can easily be enjoyed by theatre students, but it would also make a great book to have in English and theatre classrooms. The plays are short enough to read in a matter of minutes, easy enough to perform in a classroom, and topical and appealing to the target audience. This is highly recommended. Looking for a good book? 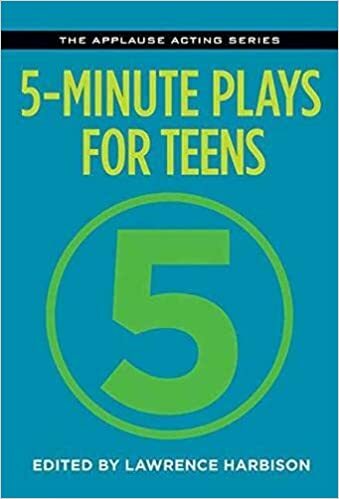 5-Minute Plays for Teens, edited by Lawrence Harbison, is a great collection of very short plays that could easily get more students interested in theatre.